Welcome to a genuine phony scandal. You may have caught a glimpse of the lurid headlines this morning, which were splashed across the front pages of many of America's leading newspapers -- and, indeed, on our own website: "Prosecutors Say Scott Walker at the Center of Criminal Scheme." The resulting impression is that the Wisconsin governor is embroiled in a serious new scandal, in which charges may be imminent. Nothing could be further from the truth. In fact, the media's breathless coverage of a recent document release has largely promulgated the opposite of the truth. On that score, Gabriel Malor, an attorney and blogger, has a must-read primer at The Federalist. It lays bare the thorough dishonesty and inanity of the current press coverage. After a short trip to a federal appeals court, the federal judge reissued his order that the John Doe probe cease. Most recently, that appeals court has ordered some of the previously secret probe documents disclosed to the public, including an unsuccessful defense that the John Doe investigators made to one of their secret subpoenas. In their attempt to get a subpoena, which was rejected by a judge for lacking probable cause, the partisan investigators claimed that Walker was involved in the so-called conservative conspiracy. And that is where the litigation stands as of today. Having launched a secret probe that has now been shut down by both the state and federal courts, the Democratic district attorneys find themselves the subject of an ongoing civil rights lawsuit for infringing the First Amendment rights of conservatives. But that is not how the media have reported the case. 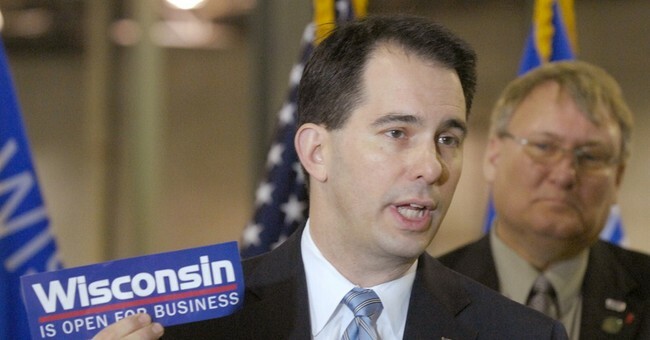 Upon the unsealing of some of the probe documents by the federal appeals court, the media worked itself into a frenzy claiming that Walker was part of a criminal conspiracy. The media claim was based entirely on the subpoena document that was denied by the state judge as failing utterly to demonstrate probable cause to believe a crime occurred. In short: the judge, looking at all the evidence, found no reason to believe that a crime had occurred. That has not stopped the media from falsely implying otherwise. Imagine if someone was sued, won his case, and the media reports the next day focused only on the plaintiff’s accusations without mentioning the verdict. That’s how desperate the left and their friends in the press are to punish Walker for his dual affront of signing the collective barganing law and beating back a liberal challenge in the 2012 recall election. He’s got a knack for thwarting them and they know it; now they need to try to blow him up on the launchpad before he’s reelected again and looks to 2016. The truth on the widely covered “John Doe” is that two judges, one state and one federal, reviewed the accusations of partisans within a Democrat District Attorney’s Office and determined their theories have no merit or basis in law. Each of these judges explicitly issued judicial orders that these partisan prosecutors must end their investigation immediately. These are the truths that need to be stated over and over again to fight the slander directed at me and our campaign by my political opponents. Still, many in the media proceed as though the opinion of the partisan prosecutors is new information and ignore the truths I have stated above. It is not. It is old news that has already been discounted by two judges. No charges. No case.